The Cruising Club of America (CCA) is presenting a one-day Safety for Cruising Couples Seminar at Indian Harbor Yacht Club in Greenwich, CT on Saturday, May 21. Geared to cruising couples and short-handed sailors who are taking to coastal or local waters on either sail- or powerboats, the seminar was created to build the confidence of the less-experienced member of the duo in the event of an unexpected test of their skills. 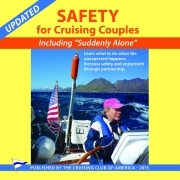 The CCA seminar workbook, Safety for Cruising Couples, revised and republished in 2015, incorporates the broad experience of CCA members as well as the new technology and techniques of safety and safety equipment that have evolved since the first edition was published 15 years ago. This seminar is based on the highly acclaimed “Suddenly Alone” seminars that the CCA has been running for 15 years. Co-sponsored by the CCA, New York Yacht Club, Indian Harbor Yacht Club and The North American Station, the day-long event is structured with a morning classroom session covering the fundamentals of VHF radios, the basics of navigation, engine operation, medical situations, safety equipment, and man overboard recovery. The afternoon session takes those topics a step further with on-the-water hands-on training, including chart plotter fundamentals, and a demonstration of how to use a Lifesling in a man overboard situation. The all-volunteer CCA, founded in 1922 by like-minded sailors committed to seamanlike offshore cruising and racing, is an international organization of more than 1,200 sailors who enthusiastically share their experiential knowledge to promote cruising and racing by amateur sailors. Over 2,000 boaters across the USA have attended the Safety for Cruising Couples Seminars, with the most recent ones selling out. Tuition, $155 per couple or $85 per person, includes lunch and the course workbook. Register no later than April 30 by contacting Janet Garnier at jgarnier02@gmail.com or 508-367-3899. Additional information on the CCA and its programs may be found at cruisingclub.org.